A manifestation is the appearance or sign of something that exists or happens. Taking this concept to the geological world, the GeoERA research programme defines geomanifestation as any distinct local expression of a geological process, past or ongoing. These expressions, although spatially restricted, result from specific geologic conditions and may help to unravel the complex geological evolution of a region. Small-scale mineral occurrences are the perfect example of geomanifestation. Mostly just briefly acknowledged in field work notebooks, uncommon minerals or mineral assemblages often tell fascinating stories if investigated in more detail. Probably the most common hosts of unusual minerals, pegmatites are small bodies of a few centimetres to hundreds of metres with complex internal fabrics and variable (usually large) grain-sizes (Fig. 1). These rocks may originate from a wide range of igneous and/or metamorphic processes and can therefore hold valuable information about the geological evolution in a region. Fig. 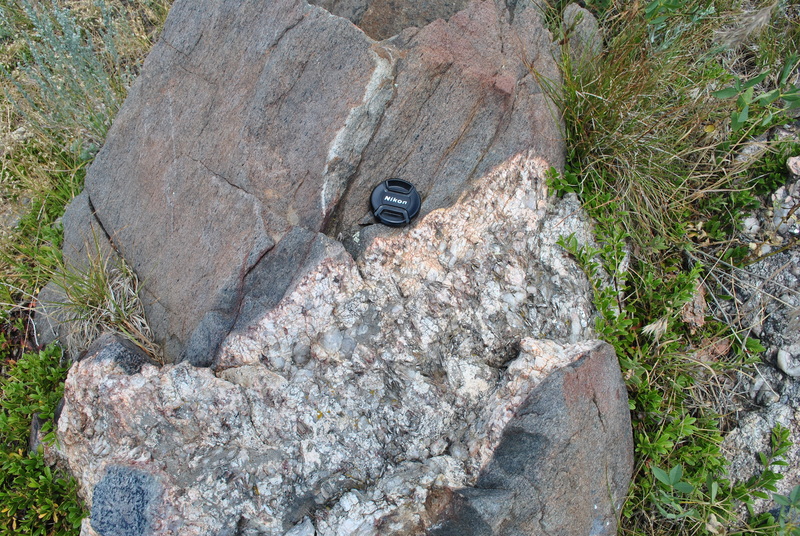 1 – Quartz-feldspar-muscovite pegmatite intrusion in Colorado, USA. Photo: Renata Barros. 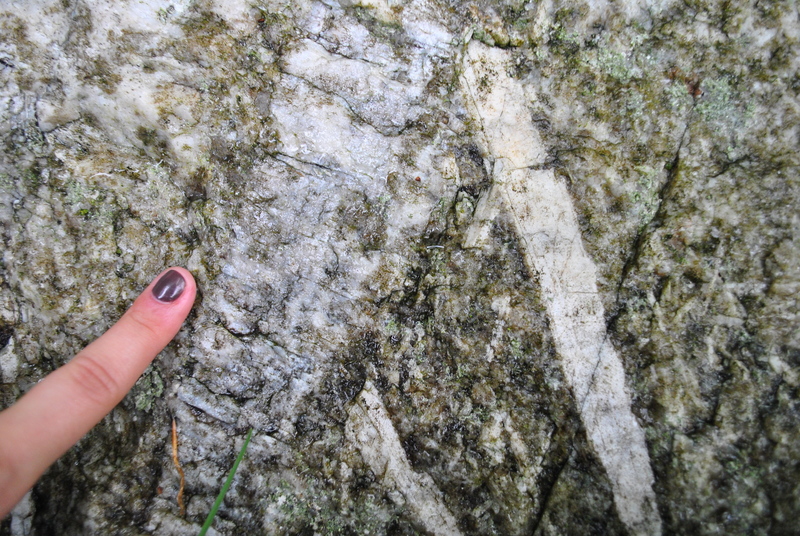 For example, the occurrence of lithium pyroxene (spodumene) in pegmatites in southeast Ireland was unnoticed for decades due to its similarity with K-feldspar (Fig. 2). Once noticed and when economic interest in lithium started to rise in the 1970s, these occurrences were treated as restricted and just loosely linked to a regional context. Trying to find more occurrences to define a deposit in the Irish lowlands was like looking for a needle in a haystack, and it was no surprise exploration work did not advance much further. Fig. 2 – Large crystals of K-feldspar (left) and spodumene (right) from southeast Ireland. Photo: Renata Barros. With the ongoing development of pegmatite research, a fresh look into the same occurrences in the 2010s by University College Dublin and iCRAG researchers [1, 2, 3] brought new ideas on how they form and migrate through the upper crust. These processes were found to be intimately linked with the geotectonic evolution of southern Ireland. Findings exposed the need to revise some of the well-stablished ideas, such as the short duration of granitic magmatism in the region that is now shown to represent a much longer period. A better understanding of these local occurrences integrating geochemistry, mineralogy, geochronology and structural geology also made it possible to trace occurrences globally along contemporaneous orogenies in North America. An improved integrated model narrowed down areas of interest where more and more occurrences are being found. In conclusion, valuable information can arise when paying more attention to small-scale geological features as mineral occurrences, spring waters, gas seeps, and many others. As it was the case in Ireland, a better understanding of geomanifestations might even be the missing part of the larger-scale puzzle. Barros R. (2017) Petrogenesis of the Leinster LCT (Li-Cs-Ta) pegmatite belt in southeast Ireland (PhD Thesis). School of Earth Sciences. University College Dublin, Dublin, 287 p.
 Kaeter D. et al. (2018) The magmatic–hydrothermal transition in rare-element pegmatites from southeast Ireland: LA-ICP-MS chemical mapping of muscovite and columbite–tantalite. Geochimica et Cosmochimica Acta 240, 98-130. Barros R. & Menuge J.F. (2016) The origin of spodumene pegmatites associated with the Leinster Granite in southeast Ireland. Canadian Mineralogist 54, 847-862.